Cancer is a subject which is difficult to write about - to avoid either too much abstractness or too depressing reality. 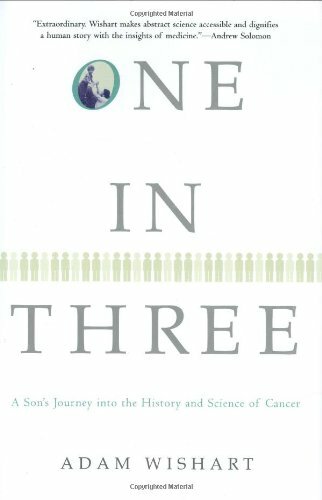 In One in Three: A son's journey into the history and science of cancer Adam Wishart skillfully manages to write about this subject whilst avoiding these pitfalls. He combines the story of his father's illness with a look at the history of cancer and its treatments, interlacing a few paragraphs about the first with a few pages on the second. The result is a book which deals with this difficult topic in a readable way. The book starts with the early ideas about cancer, and goes on to look at early forms of treatment such as the fairly drastic surgery of the 19th century. With the discovery of radioactivity came the possibility of radiotherapy, a breakthrough in the treatment of cancer. But radioactivity is a double edged sword, and it soon became clear that those working with radioactive substances were especially prone to cancer. It was also seen that many other pollutants could cause the disease, but whether they were responsible for the drastic increase in cases of cancer during the 20th century was less clear. The consensus is that smoking is the principal culprit, but the argument goes on, with many people feeling that this shouldn't mean that the effects of pollution are ignored. After the Second World War, the growth of organised science meant that a large number of chemicals could be tested for their possible use against cancer. Thus chemotherapy became available, and its successes were often seen as miraculous in reports by the media, thus encouraging people to look forward to a time when all cancers could be cured. Indeed, these treatments may well be considered miraculous, but deaths from cancer continued to increase. Wishart describes how after his father's cancer was initially discovered, it was quickly treated and it seemed that a return to normal life was possible. One then sees the frustration when a later recurrence could not be dealt with in the same way - how it can seem like the problems are due to incompetence on behalf of the medical profession, and how this might lead many people to become disillusioned with conventional medicine. But his father had a career as a professor of statistics, and his mother as a doctor, so they didn't have any unreasonable expectations about what could be done. Sometimes there was the opportunity for successful treatment - his mother had suffered from breast cancer over twenty years before, but it was quickly dealt with and she was still going strong when the book was written - but sometimes there wasn't such an opportunity. What seemed to be the most unsettling aspect of the situation was that the cancers which occurred were secondary cancers, originating from a primary cancer somewhere in the body. However this could not be found - it was possibly only a couple of millimetres in size. Following the successes of chemotherapy in the 1950's and 1960's, there was a feeling that if sufficient funding were available then cancer could be defeated - hence the USA's 'War on Cancer' in the 1970's. The idea here was that the basic research had been done, and that it was now necessary to concentrate on the search for actual cures, in the same single-minded approach which was applied to the moon landings. As such it was a failure - there were benefits from the extra funding, but these were predominantly in the area of basic research, in particular the new discoveries in genetics. The book describes what has been discovered about the genetic basis of cancer, and goes on to show how this has lead to treatments, and promises more successes in the future - if not outright cures, then the possibility of managing cancer, so that it is no longer considered a death sentence. There is also a chapter on the alternative therapies which have been used against cancer, and in particular the work of the Bristol Cancer Help Centre. One sees how these approaches arose as a reaction to the impersonality of conventional medicine, but also they had a tendency to give rise to their own forms of dogmatism. More recently the approach has been to act in unison with conventional medicine and so offer more personal help for those suffering from cancer. I felt that Wishart's combination of the personal and the scientific viewpoints was highly successful. The history and science never gets too far from personal experiences, while at the same time the story of his father's cancer - which isn't glossed over in any way - doesn't become too depressing. The book provides a useful link between a patient's point of view and that of the science of cancer treatments. Hence I would recommend it to medical professionals wanting to see how they might be seen by their patients, as well as to patients wanting an indication of why their treatment might not be as straightforward as they think it should be. It also gives an indication of why the breakthroughs reported by the media don't become converted into miracle cures overnight. But most of all this is a fascinating book to read - I have to say that I found it really was a book which was hard to put down.